Qlik’s first Research Digest looks at new patterns of multi-device behavior at work. As I write, a couple of Apple and Android tablets sit by my desk. What are they for? That’s a good question. Just last year, I used them regularly, traveling with a tablet and Bluetooth keyboard rather than a heavy laptop. Now? Perhaps I will check email while lounging with some coffee. I browse social networks - cat videos! - because tablets are great media devices. But I rarely use one for serious work. My lightweight laptop is great for travel and office alike. It’s not just me. Chromebooks are rapidly gaining market share and mind-share in education from iPads. Business users and IT departments who demanded native tablet applications a couple of years ago, now rarely even mention the devices. At Qlik we work closely with customers and partners to understand their needs, running some excellent ideation and validation programs with the community. But the Innovation and Design team wanted to take this further, tuning in to what my colleague James Richardson calls the “weak signals” of future patterns. So, today, we publish our first quarterly Research Digest, consisting of raw market intelligence, interviews and articles from technology leaders. For Summer 2015, the topic is “The Role of Multiple Devices in the Workplace.” Feel free to download it - there are no strings attached. We want these digests to grow into a fruitful resource for Qlik, our customers and partners, and the industry at large. Our quantitative and qualitative research into the use of multiple devices helps us understand not only how people use smartphones, tablets and personal computers, but how they use these devices together. This interaction between tools has been quite neglected, particularly in the business intelligence space. There is a lot of material in the research digest, so please do explore it, but I’ll share here a selection of the insights we gained, including some about those tablets lying on my desk. It’s good to know I am not alone in my new habits! Overall, it was clear that people regularly switch between devices to complete business tasks. Different devices - whether a watch, phone, tablet or laptop - could be convenient in different contexts, so an activity may start on the best device at hand and then switch to another device. This gives us important clues to the preferred devices for certain tasks. Have you stopped taking the tablets? Some media activities, such as watching videos and conferencing, are popular on tablets. On the other hand, although business users may start working on a document on a tablet, 79% of them will switch to a computer to complete the task. This reluctance to switch to a tablet is also true for reports and dashboards. 55% of users switch from a tablet to a computer to view these BI artifacts: only 20% would switch the other way around. It is tempting to think that this is because the mobile form factor is not sufficient for viewing reports and dashboards. However, if users start this activity on a phone, 52% of them will complete the activity there. 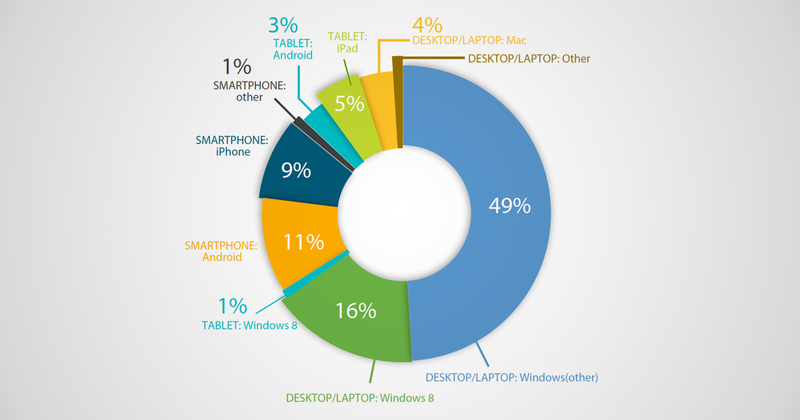 No one, not one, reported moving from a smartphone to a tablet. And if the activity starts on a tablet, only 25% of users will continue there. Research such as this can be very useful on its own, but it is even better as a springboard for discussion and debate. Disagreement can shed a lot of light! So, the digest does not only include quantitative research, but some compelling interviews and articles. Looking even more broadly around the industry, we have opinions from manufacturers of touch screens, from data warehousing experts and major consultancies. We would like you to enjoy the research digest as a well-informed conversation. And we would love to hear back from you too about your own opinions and findings. Again, feel free to download it here - and read it on whatever device you like!